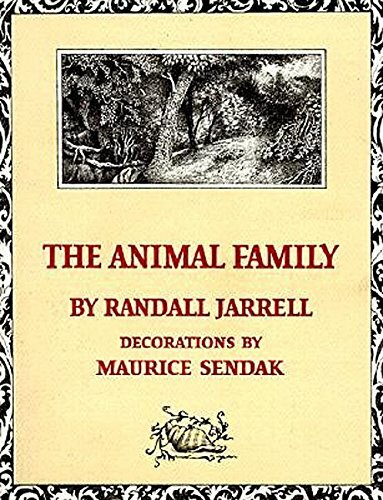 In another read for the Once Upon a Time challenge, I picked up The Animal Family by Randall Jarrell, illustrated by Maurice Sendak. It’s an old book and a Newbery Honor, but I’d never heard of it until recently. It’s a short book, fable-like and charming. The story centers around a hunter who lives all alone beside the shore–until one day he hears a mermaid singing. He coaxes her ashore by singing back. She learns his language and eventually comes to live with him. Together, they find and adopt three orphans: a bear, a lynx and a human boy. This is a sweet little story about family and home, and very different people (creatures) coming to understand and accept each other. What might be most surprising is what doesn’t happen–the mermaid never becomes human. She comes onto land to live with a human man, and certainly she and her life change, but she doesn’t give up who she is. In fact, the book largely slides right over the practical problems of a mermaid on land, which in some ways is slightly bothersome (I mean, how does she even get around?) but I think is worth it in the end. The mermaid, the bear and the lynx all become part of this family without changing their essential natures, and are fully accepted by the other family members, despite some obvious practical problems (the bear, for instance, is really too big for the house, once he grows up). The book doesn’t focus on the challenges, and in that way reinforces the message that there’s really nothing wrong with any of them, and that they’re loved as they are. And there’s something fun about a story that doesn’t center on how a mermaid copes with the land, but just tells about her life coming ashore and once she’s there. The boy reinforces and seals the theme of acceptance. He’s so accepting of his family, including his mermaid mother, that even when the hunter and the mermaid tell him he once had other parents, he believes this must be just a story or game. Because obviously his family is his family. The book’s style is quite fanciful and fable-like, which maybe is another reason it doesn’t need to get too much into practical concerns–because fables don’t, you know. If I haven’t yet intrigued you about this one, I’ll just finish up by adding that the copy I read included a blurb recommending it–from P. L. Travers, of Mary Poppins fame. I think that’s the first time I’ve seen that! The book must be good if it’s recommended by P.L. Travers! How old is this book? It sounds like it’s ahead of its time with the theme of acceptance in a very untraditional family.